Kings XI Punjab finally opened their account in the points tally with a comfortable win at their home ground PCA Stadium, Mohali against Rising Pune Supergiants. RPS managed to put on 152/7 in their 20 overs despite getting a good start from their top order. Chasing 153 to win, KXIP were given a great start as their openers Manan Vohra and Murali Vijay scored fifties. However they lost 4 wickets in quick time with both openers back in hut. But Glenn Maxwell ensured his team 2 points with a quick fire unbeaten 32 and guide his team to a 6-wicket win with 8 balls to spare. Here we look at all the stats and records recorded during the game. 0 – Number of sixes hit in Rising Pune Supergiants’ innings. This is the 1st time a team’s innings of 150+ didn’t feature a six in IPL. 1 – Kevin Pietersen is the first England player to complete 1000 runs in IPL. 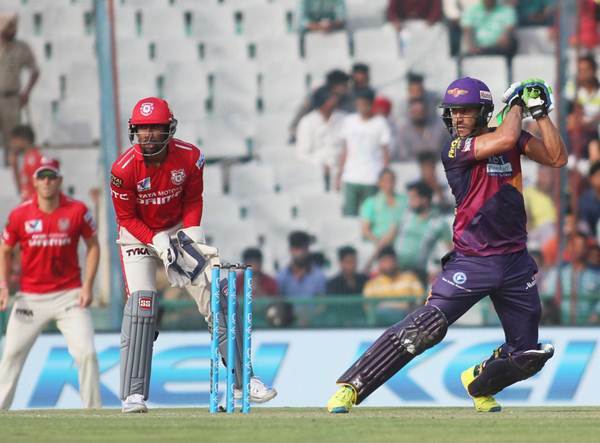 1 – Kyle Abbott made his IPL debut in this game. He was part of CSK squad last year but didn’t feature in first XI. 2 – Only the 2nd time in his professional cricket career, Kevin Pietersen failed to score a fifty plus at PCA Stadium, Mohali. He has scored 5 fifties and a century in the 8 innings he played there. 6 – Number of teams Thisara Perera has represented in IPL. Only Aaron Finch and Parthiv Patel have represent as many as 6 teams. 20 – Number of matches Irfan Pathan has missed for his sides in last 3 editions of IPL. 22 – Innings played by Murali Vijay in Twenty20s since his last fifty plus score in this format. 32 – Runs scored by Glenn Maxwell for KXIP at Mohali before this game. He scored exactly same without getting out in this game. 100 – Ravichandran Ashwin became the 17th player to feature in 100 IPL games. 1004 – Runs scored by Steven Smith in IPL. He became the 51st player and 10th Australian to complete 1000 runs in IPL. 2014 – Last time a KXIP opener scored a fifty in IPL was Manan Vohra in the final of the 2014 edition. In this game, Vohra and Vijay scored fifties. This was the first instance for KXIP since 2011 where both their openers scored fifties.